Marina Bay Yacht Harbor has embarked on a long-term project to replace the power centers for more than 800 slips at the marina in Richmond, California. Harbormaster Steve Orosz said the marina is phasing in the updates over several years due to the large number of power centers to be replaced. The project came about after it became difficult to find parts for the existing power centers, some of which were installed when the marina was built in the 1980s. Some power centers were upgraded in the early 2000s, but even those were starting to require repairs and parts were hard to find. “We are in an almost constant process of upgrading and replacing a number of units every year. We replace an average of 50 to 75 units each year,” Orosz said. He estimates the cost per slip is $1,000 to $1,500, depending on the configuration of the power center and if other associated repairs are needed during the process. The overall cost is included in the marina’s annual maintenance budget. Often when they start working on the power centers, they have to replace the dock box and kneeboards underneath, which can entail changing out the water faucet and supply line. Depending on other tasks scheduled that day, the maintenance staff can replace three or four power centers in a day. The maintenance staff takes advantage of other repair projects, such as waler replacement, which require the removal of dock boxes and kneeboards over a large area, to replace the old with new whenever possible. However, most of the replacements have been on an as-needed basis when there is an issue with the existing equipment. The original power supplies were stainless steel Unicorn power centers with “jelly jar” type meters. “They are what started the process,” Orosz said. “We find that if we have to take them apart to make repairs, we often can’t put them back together since some parts can be badly corroded and we can’t source replacement parts.” In the early 2000s, Midwest power centers with electronic meters and plastic dock boxes were installed. Over time, the plastic dock boxes became brittle and broke, so they have started replacing those with fiberglass dock boxes. Orosz said new power center options have become more affordable over the years. They chose Eaton Newport Harbor Mate power centers attached to fiberglass dock boxes for most of the slips. Eaton Lighthouse pedestals were installed at select locations, such as end-ties and side-ties. Orosz said the pedestals work well in those locations because they have the option of choosing dual 30-amp/50-amp or single 30-amp as needed. California law requires the sub-meters for the slips to be certified by the local Weights and Measures office before being installed at the marina. Paul Seff, an engineering manager for Eaton, said when the company receives an order for meters to be installed in California, it advises customers to allow extra time for the certification process. When Eaton receives the order, the meters are sent to the appropriate county’s Weights and Measures office for testing and certification. Once approved, the Weights and Measures office seals the meter and returns it to Eaton for installation in the pedestal or power center. Seff said depending on each county office’s workload, it could take two weeks to get the meters back or as long as 12 to 14 weeks. Once Eaton receives the sealed meters from the Weights and Measures office, it takes another week to 10 days for the meter to be installed on the pedestal. “This (the certification process) makes the supply chain more challenging,” Orosz said. The state requires 10 percent of the marina’s meters to be recertified each year, and each certification is valid for 10 years. “We address that with our replacement rather than pulling meters out of existing units and sending them in, which Weights and Measures agreed was not practical,” Orosz said. Seff said Michigan also has meter certification requirements, and he thinks other states may enact similar requirements as electricity becomes a more expensive commodity. During the course of replacing the power centers, the project evolved to include the installation of improved ground fault monitoring. The marina has Bender ground fault monitoring units on each transformer to monitor circuits on the dock. However, because of the multiple slips on each circuit, the units might display a fault reading when there is not an issue with the individual boats. The combined leakage and reading for all the slips on the circuit would produce a fault over the 100mA threshold. The solution was to install ground fault monitoring at each power center. Seff said installing the RUM units on each slip allows the marina staff to narrow down the problem when there is a ground fault reading. 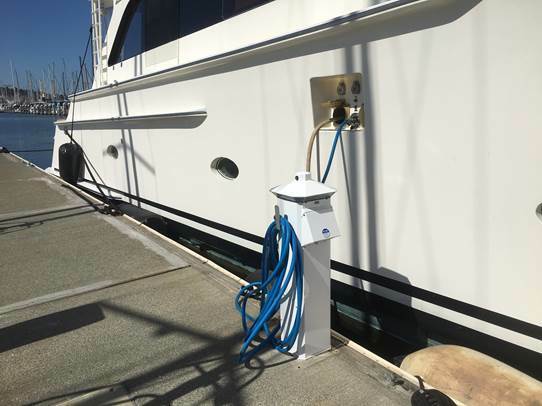 The units also allow the marina staff to see electricity consumption data in real time, and the remote meter reading option means the staff does not have to walk from slip to slip to get meter readings for billing. “The RUM unit adds a lot of functionality to the pedestal,” Seff said.